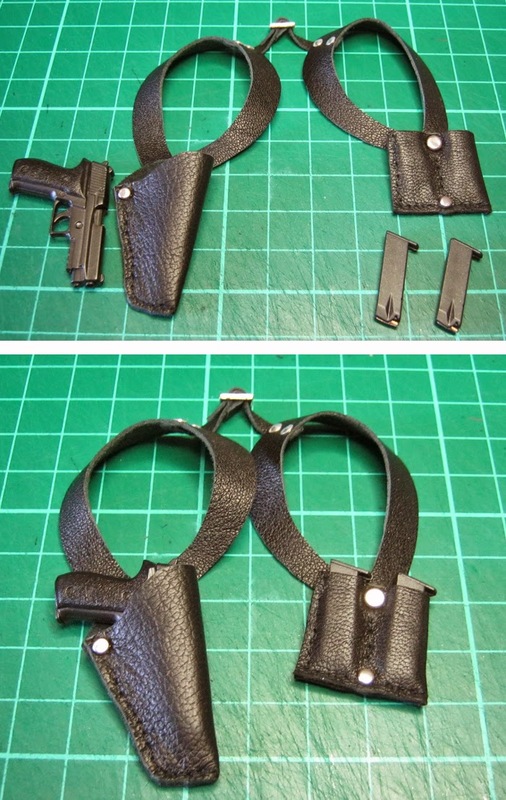 For the little gun, I wanted to make a shoulder holster. It worked out well, but alas the scale of the doll means that the gun itself is too bulky to be hidden under the coat without making bulges. No matter. I wanted to make one and I was pleased with what I achieved. Lots of pictures again, because this is so different to what I usually do, I'm really enjoying it. My apologies for the rude-ish teeshirt slogan, btw. Cussing doesn't bother me much. I'm an ex-biker and I've been on the interwebs for too long to be easily offended; but I tend not to swear when I'm blogging, and I appreciate there are people out there who would rather not see it. Heh heh, I'm making several teeshirts with slogans, and I probably wont be able to show some of them on my respectable doll blog. The slogan made me laugh!! Hee, good. :) I sometimes worry about offending someone.